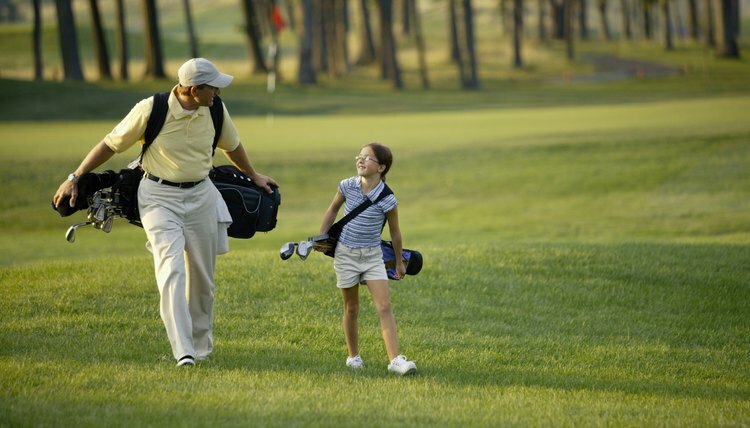 A golf outing forms a special bond between child and parent. Golf is an enjoyable game for people of all ages and skill levels, but only if you have the right equipment. Children need their own sets of clubs scaled to their size. You wouldn't expect an adult to take clubs that are too long and cut them down, so don't expect your child to learn to play with cut-down clubs either. Using the proper clubs from the outset can help a child avoid learning bad habits. Start with a few clubs. Children are sometimes overly enthusiastic about a new activity, then lose interest. Rather than waste money on a full set of 14 clubs, select a few clubs they can use in the backyard. Consider the child's age. Start with a putter and 9-iron for younger juniors. Add an iron as they get better. Wait on buying the woods. Young children don't have the strength to hit the ball very far. That means that they can't take advantage of using different woods. Consider a hybrid club until they can hit hard enough to understand the difference between clubs. Measure the child's height. Junior clubs are sold individually and also in sets for children from 27 to 63 inches tall. A lanky 10-year-old needs a longer club than would a shorter 12-year-old. A more individual fit is obtained by selecting individual clubs; however, sets are often less expensive than buying each club separately. Sets are sold by age and height. Ignore fancy technology and expensive materials. Until children grow to where they are close to adult height and strength, expensive equipment isn't going to help their game much. Clubs of appropriate weight and length are more important. What Is the Maximum Height for Youth Golf Clubs?